Mangaluru, Dec 02, 2017: Chairing a Transport Adalat at the office of the Senior Regional Transport Officer in the city, Joint Commissioner (Transport) Shivaraj Patil, said that according to norms, the foot board in buses should not be above 52 inches. Transport Department officials have been closely following it and are not issuing fitness certificate if the footboard was more than 52 inches. 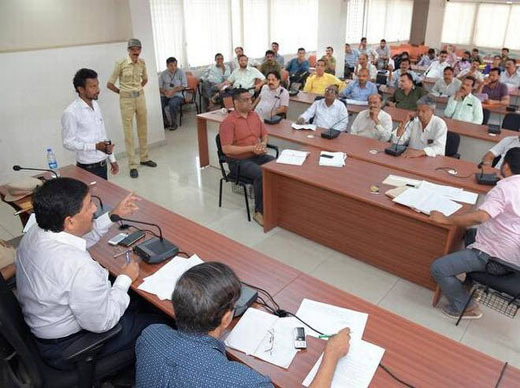 The Regional Transport Office will not issue fitness certificate to private city buses if the footboard is found to be higher than 52 inches from the ground, which causes problem to commuters, Joint Commissioner (Transport) Shivaraj Patil has said. Jt Comm Patil was answering to a question raised by activist Hanumanth Kamath. Kamath said following the Transport Adalat held two months ago, the then DC K.G. Jagadeesha had directed private buses to have footboards of their buses conform to norms. “But so far we do not see private buses following it,” he said. Countering Kamath’s allegation, In-charge Senior Regional Transport Officer S.G. Hegde said officials have been regularly checking the height of the footboard and other requirements when buses come for fitness certification. When Hegde sought specific details of buses not confirming to the norms, Kamath said it was difficult for people to check the height. He alleged that some buses do not come for fitness certification. To this, Patil said henceforth the schedule of buses undergoing fitness certification will be made public. On the allegation by a Vitla resident that the Gram Panchayat has passed orders barring KSRTC bus to Pakkalakunja village from stopping near the Vitla Market, Patil said the issue will be referred to the Regional Transport Authority. On the demand of activist Gopalakrishna Bhat seeking regular checking of two-wheelers for insurance, Patil said the department will shortly start the exercise to seize vehicles that do not follow norms, including absence of insurance. Patil asked Hegde to inquire into allegation against a private bus operator not operating his bus between Mangaluru and Karkala.